A small round oval citrus, kumquat resembles a small orange. The kumquat grows on trees that originated in China. It can be found in California, Florida, Mediterranean countries, China, Japan, Indochina, Indonesia, Israel, Peru and Brazil. hybrid kumquat, when crossed with other citrus fruits, include limequat, lemonquat, naranjaquat, and calamondin ( a cross with tangerine). kumquats sometimes sold with a stem and attached decorative leaves. Avoid fruits with damaged skin and soft sitting. The peak season for kumquats is from November to February. Preparation, uses, and tips In this fruit, the rind is edible, tender and sweet, while the meat can be very dry and sour compared with oranges. 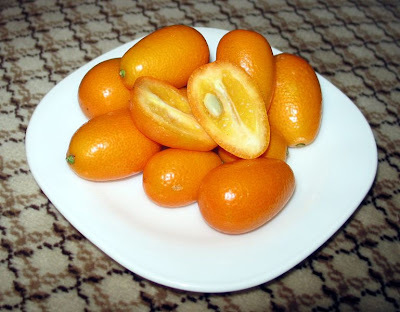 Kumquats are usually eaten raw, as the whole fruit, excluding seeds. They make a surprising side dish, especially when used with the leaves still attached. As with other citrus, kumquat can be candied, marinated, cooked as jam, added to fruit salad, poached or preserved whole. * foods that are an “excellent source” of a particular nutrient provide 20% or more than the recommended daily value. Foods that are a “good source” of a particular nutrient provide between 10 and 20% of the recommended daily value. benefits and health concerns Allergies and sensitivities (food and chemicals) a diet low in allergens, also known as an elimination diet is often recommended for people with allergies suspect foods in order to find out if avoiding foods common allergens gives relief of symptoms. This diet eliminates foods and food additives that are considered common allergens, including citrus fruits. Some popular books offer guidance to people who want to try this type of diet. Most elimination diets are very restrictive and increase the likelihood of nutritional deficiencies. A successful elimination diet is usually followed by the reintroduction of eliminated foods one at a time, to see what really allergens the individual and therefore should be removed indefinitely. Strictly avoid allergenic foods for a period of time (usually months or years) sometimes results in the foods no longer cause allergic reactions. Restrictive elimination diets and food reintroduction should be supervised by a qualified professional health. The food allergy and food additives is a common cause of hives, especially in chronic cases. Citrus fruits are among the foods most commonly reported to trigger hives. Numerous clinical studies show that diets that are free of foods that commonly trigger allergic reactions typically produce significant reductions in symptoms in 50-75% of people with chronic urticaria. People with hives should investigate the possibility that food allergies are causing your problem by consulting with a doctor.